So, train travel is incredibly inexpensive, and if you’ve got the time, it is totally, totally worth it. I bought tickets for Lloyd and I and even upgraded to the littlest sleeper car room for 3/4 of what one last-minute plane ticket would be. I was so excited!!!! A tiny little room that would meet all my tiny-house expectations! I poured over internet videos and the Amtrak site during the whole week, endlessly imagining what the ride would be like. So, with that said, here are photos, because these are the things I wanted to know before I got on the train. 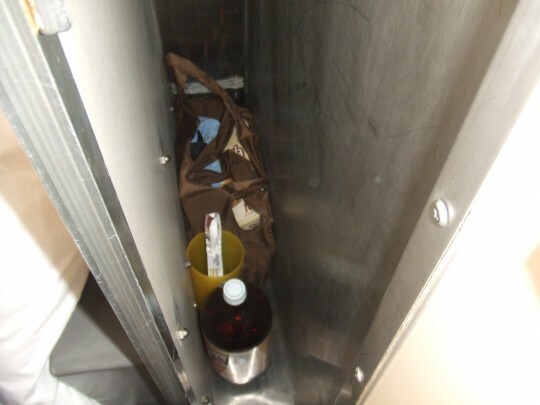 Yes, there will be room in the ‘closet’ for your 2-liter bottle of pop. Our second train had a different closet set-up, though. 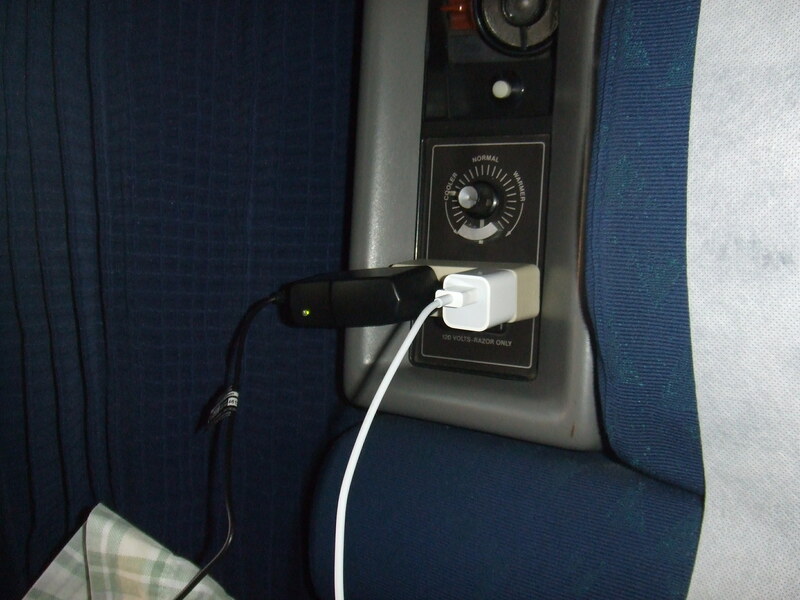 Yes, there is only one power socket. Bring an adapter if you have other things to plug in. The room is small. Smaller than you think it is after you’ve looked at it on the website. Sitting up is very comfortable, though. When Lloyd has a cold, he will sleep a lot. 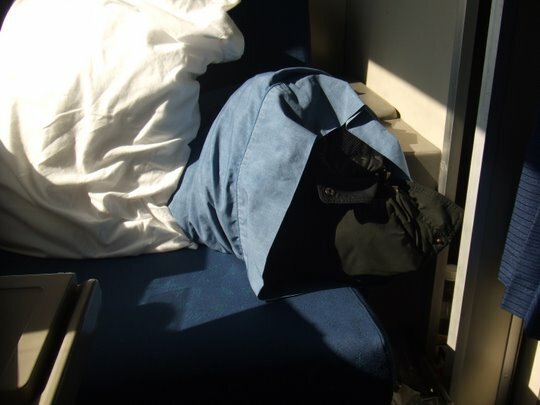 This is idea that I’m quite proud of: If you are travelling in winter, bring along a pillowcase for each coat. You won’t have to find a place to store your coat – you can stuff the coat inside and use it as an extra pillow! 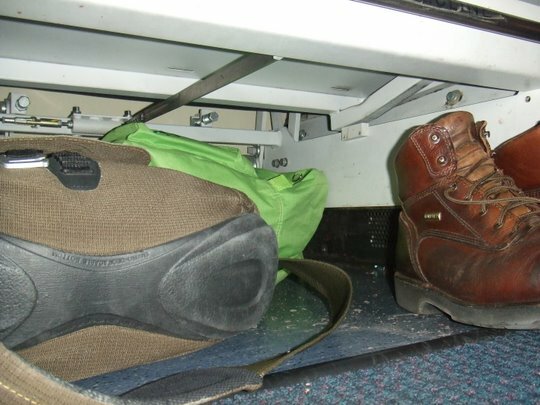 There is room all the way under the seat to store your stuff. 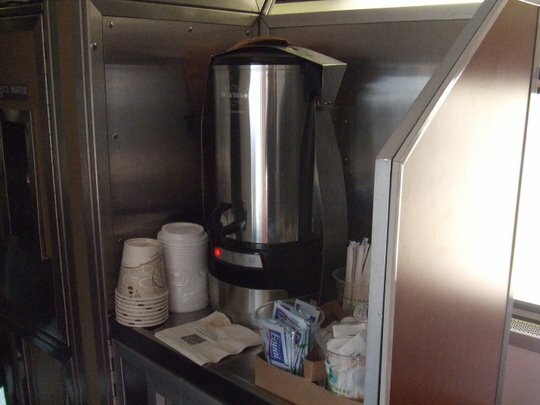 There is a coffee and juice station at the end of the rooms. Yay for free drinks! So: ‘Yes’ to train travel! ‘Yes’ to the sleeper car! The pictures make me feel a little claustrophobic. I suppose the window makes it feel a lot larger than it looks. We had dinner last night with a couple, and the man had severe claustrophobia. He said this second train ride was much easier on him, because he knew what to expect, and now he liked it. The great thing about the train is that if you can get up and walk around. So, is that just a curtain separating you from the hallway? And are your seats/beds facing each other? And do they recline any for you to actually lay down sleeping? And is the dining car for another post? Because you ate something, right? And I’m with Brad. It’s the constant derailing that pushes me just to the brink of hyperventilating. There is a door besides the curtain, and you can close both or just one. A closed curtain gives privacy but allows ventilation. We closed both when we slept. The chairs turn into one bed and then a narrow bunk folds down from the wall, so you have bunk beds. I should also have noted that the pillow case for your coat idea is Pure. Genius. So what was the total time of the train ride? I took the auto-train once to Florida. It started out well enough. But by about 10-11pm, I had had enough. I was tired & couldn’t sleep in the reclining seats we had. It was a looong night. But a cool experience. 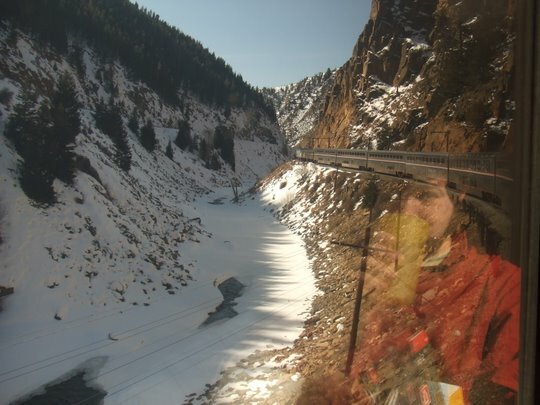 Oh, and I never worried derailment….until NOW Brad & Beth. That scenery in the mountains is GORGEOUS! 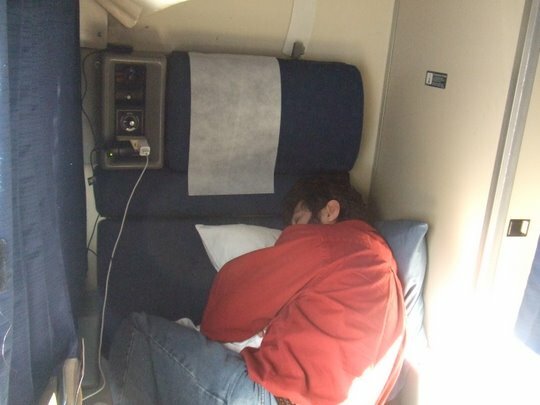 It’s a 16 hour train ride, or a 12 hour car ride. However, Lloyd and I always break up the drive into two days, so it’s 6 hours of driving, sleep in a hotel, 6 more hours of driving. On the train -- our hotel gave us a ride! We made Alisha ride with the cattle until her last ride, mean aren’t we! After finals she would just sleep. But the whole bed and eating with different folks is great isn’t it? And the walking around is fun. On our way home from our visit with you we played cards with a young man in the observation car all the way home! So could you walk from car to car all the way to the front of the train? I’m stealing your coat/pillow idea. That is sweet! It’s like walking to the back of the subway train, only not so scary, because a train is built for that and the NY subway is not. I believe you experienced this once. 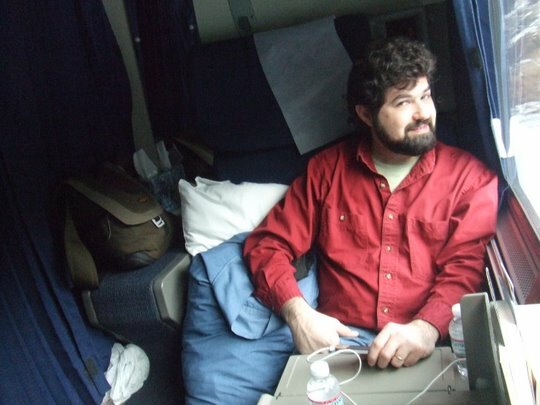 I’m reading about the history of coach travel by train and your living it…sort of. I envy you, especially the scenery. You gotta check in the next couple of days then, John!